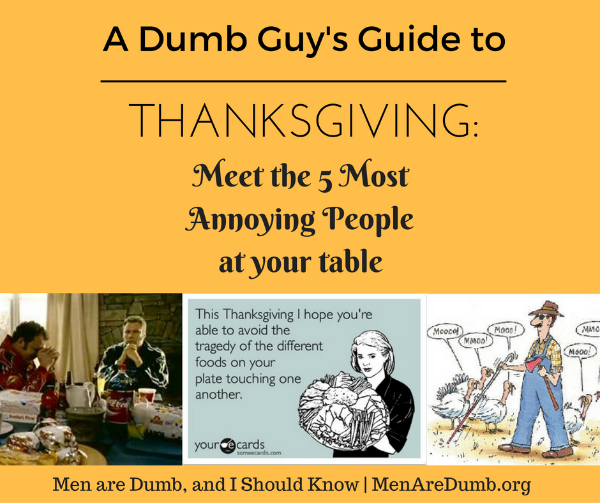 What’s worse than dry turkey at Thanksgiving? 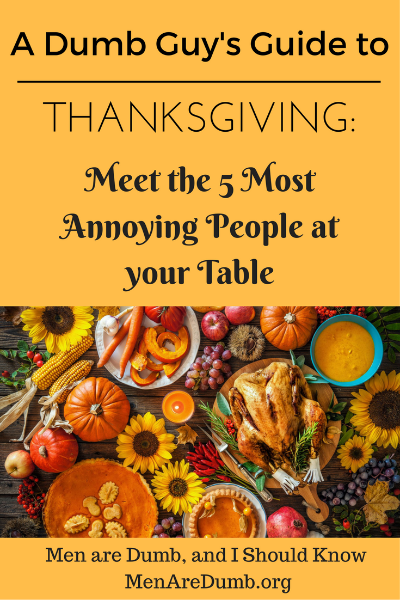 Check our list of the 5 most annoying people at Thanksgiving and see if you relate. Most family get-togethers are like ‘Survivor’ with bad food, bad “tribe members”, and more, but you can’t be voted off. You have to stay til it’s over. Oh, and no million dollar prize. This could be one person or a whole group that seems like they like in an Amish community all year long and have a distinct aversion to anything with an on switch and fun. They give long impassioned, guilt-ridden speeches about how bad society has become with Smartphones, video games, etc, and how technology is stealing human interaction and how inevitably it will lead to the end of the human race. To save us all from our insatiable lust for Technology, the Anti-Tech brigade produces a large wicker basket (Obviously made by the Amish they must live with the rest of the year) for everyone to put their Smartphones, Video game controllers, etc in. Why do ladies put sooo many pillows on the bed??? Others try to explain why technology is valuable to life these days, but it falls on deaf ears as the wicker basket is slowing pushed toward the “Tech Addict” trying to verbally wrestle their way out of giving up their tech for the day, but the sad-eyed look by the “Anti-Tech” person is too much and the Smartphones get placed in the basket to the chagrin of the rest of the group. See, no technology now – just like “Survivor”. No matter what Bill Maher says, people believing in religion in and of itself isn’t bad, but hyper-religious people at Thanksgiving is worse than any ‘Saw’ movie scenario. I feel that atheist and agnostics really miss out a lot of the good stuff of religion, but the one thing I would wish on atheist is the long-winded Thanksgiving prayer. If you thought watching the entire, unabridged Director’s Cut of the Lord of Rings trilogy was long, that’s nothing. 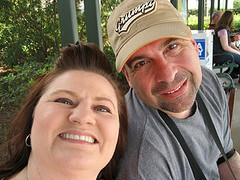 The oldest person there is always chosen to say the prayer and let them go on an ad-libbed prayer-a-palooza for every state, country, person that voted for the “wrong person”, Rick and the rest of the group trying to survive with all those zombies, those people that were on the Titanic boat, Darth Vader and Doctor Strange. They wear their “I Voted” sticker like a badge of honor, and before you don’t ask who they voted for, they will tell you. They will also tell you – if their candidate loses – how the other side rigged it that way. You may also learn more about the Illuminati and ‘news’ items from websites that use phrases like ‘everyone knows that’ and ‘we heard from our sources that’, etc. If the turkey is too dry, never answer these people when they say, “You know why this happened, right?”, just make more gravy. Sure, I could stop right here and we’d have quite the wildest Thanksgiving ever, but wait – there’s more. Thanksgiving really brings out more goodness than usual and there is always one (or more) extra person(s) invited to share in the goodness of Thanksgiving with the rest of the family. This goth person arrives completely dressed in black with china white skin and a Tim Burton tattoo partially exposed. They are very soft-spoken until the Thanksgiving prayer in which they don’t join hands in protest. Instead of praying with the rest of the family, they sing, “This is Almost Halloween, This is almost Halloween -“. As strange as it sounds, they get along swimmingly well with the Hyper Political person. They trade conspiracy theories and distrust for most everything. Interesting as it seems, they would have the best voice for the “sing-along around the piano” time – only if it’s songs by The Cure or Nine Inch Nails. Do you have any wild Thanksgiving stories? Leave a comment below and tell us.